An empty clam shell on the beach. I went for a walk on the beach at Gillis Park today. 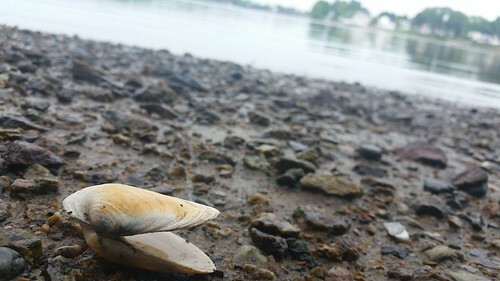 This empty clam was just sitting around enjoying the view, or at least, that's how I imagine it like it were some Pixar film. Of course, it stuck out to to me because it's a white and yellowish object among a field of browns, blacks, and greens. Now that I look at the clam closer, I can see small little bugs on it--I'm guessing they're looking to clean out any lingering reminents of the clam that used to live in the shell. And when I look even closer, there is a whole army of the buggers to the left of the clam in the bottom corner of the photo. It makes me almost wish I had seen them and tried to capture them.